Sofia, the capital city of Bulgaria, has more than two million inhabitants and only 13 ambulances... Ilian Metev's gritty, multi-award-winning documentary follows two medics and their driver as they struggle to cope amid a decaying health system. Filmed over a period of two years we watch these three who risk their lives' for others. Metev's film, refreshingly, lacks any sensationalism, political agenda or contrivances. Instead, this fly-on-the-dashboard record just follows the lives of this ambulance crew as they go out into the night to help the injured and needy. Filled with humour and camaraderie as they relentlessly go about saving lives, yet the strain of a broken system is taking a human toll on our unsung heroes: how long can they keep fixing societies injured until they lose both their devotion and their empathy? This extraordinary portrait manages to be intimately heartbreaking and rigidly unsentimental. • New HD digital transfer, approved by the director. • ‘In conversation’ - a new and exclusive filmed piece with director Ilian Metev and sound recordist Tom Kirk. • Booklet featuring a new essay by the films editor Betina Ip. Second Run and DocHouse present a special screening of Ilian Metev's terrific award-winning documentary SOFIA'S LAST AMBULANCE at ICA Cinema on Thursday October 2nd at 6:30pm. Director Ilian Metev will be in attendance to introduce the film and discuss it afterwards. Don't miss director Ilian Metev and the briliant SOFIA'S LAST AMBULANCE at ICA tonight! For those who missed our ICA/DocHouse screening of SOFIA'S LAST AMBULANCE with director Ilian Metev - here is a podcast of the post-screening Q&A with the director and DocHouse's own Elizabeth Wood. Here's another title I'm grateful to Second Run for releasing. I haven't seen it yet, but it's exactly the sort of discovery I expect from your label -- something I've never heard of before that, once I've read a few sentences about it, seems utterly essential. I'll definitely be importing this disc with my next Amazon U.K. order. warren oates wrote: Here's another title I'm grateful to Second Run for releasing. I haven't seen it yet, but it's exactly the sort of discovery I expect from your label -- something I've never heard of before that, once I've read a few sentences about it, seems utterly essential. I'll definitely be importing this disc with my next Amazon U.K. order. Thanks for your trust in us, warren oates, we really appreciate it. The disc also contains the director's Graduation short GOLESHOVO - do watch it as it's quite special too. "There are moments in observational documentary that sometimes seem to rise to the drama of fictional cinema, and Ilian Metev’s SOFIA'S LAST AMBULANCE has plenty such. They come when the viewer becomes in some way so engrossed in what is on screen that the standard distinctions of form seem to be lost... the sheer truth of observation, not to mention the camaraderie humour, brings the film up to another level entirely"
Often the best film experiences are those that take you completely by surprise, or when you stumble on something unexpected from a part of the world you knew relatively little about. 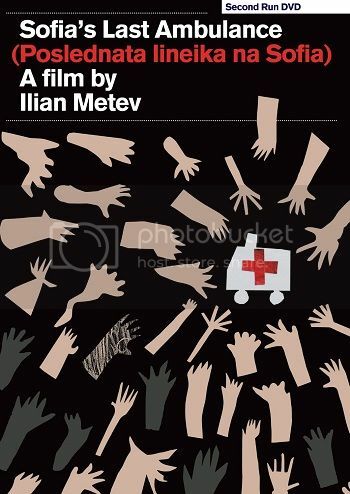 I’d never heard of Bulgarian director Ilian Metev before, and Sofia’s Last Ambulance is one of these unexpected gems. 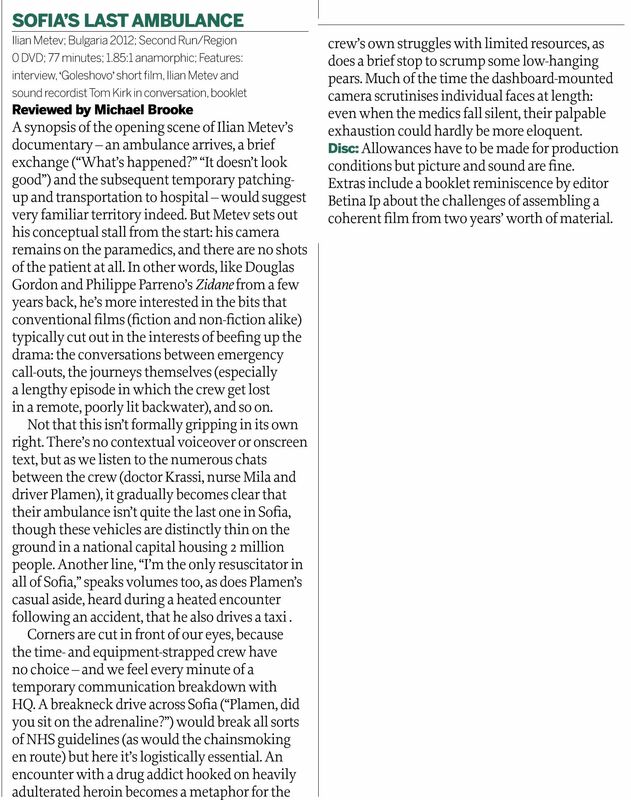 It's a consistently captivating and enlightening work, and by sidestepping the sensationalism and audience-grabbing dramatics that seem endemic to the emergency response sub-genre, Sofia's Last Ambulance gets us closer to its trio of dedicated medical professionals than all of their multitude of televisual forebears combined. "An intense, up-close documentary from Second Run... a quite notable release of a film that seemed unlikely to get this kind of even modest attention in the English language home entertainment market but one which certainly deserves it"
I really got nothing out of this. The film is composed of tight close-ups of the three members of an ambulance crew, to the exclusion of almost all else. We hear but don't see some relatives and the few conscious and not dead patients. The majority of their calls seem to be for patients that are either already dead, don't need hospitalization, or the address can't be found. As the film wore on with its dashboard cams, I longed to see some of the city of Sofia, other Bulgarians, or even just the condition of the roads. For me this was a frustrating, hollow experience. Basically it's Kiarostami dash-cam meets Mr. Lazerescu's ambulance crew -- and I don't care for either of those influences. I did like the short film on the disc, a doc on a poor village stocked entirely with left-behind elderly folks. I'm quite a fan of 2nd Run, and picked it up as a blind buy. But if I knew what it was I probably would have skipped it, despite being a big fan of the 21st C documentary revival, and planning a trip to Bulgaria/Romania. Congratulations to Ilian Metev on winning 'In the Cinema of the Present Award' at the Locarno Film Festival for his new film '3/4'. Delighted to have released his previous extraordinary doc SOFIA'S LAST AMBULANCE - can't wait to see this one.